Home › Boiler Replacement Scheme › Can I Get A Free Boiler If I’m On Benefits? In short, yes. However, you can’t just be on any benefits in order to qualify for a free replacements gas boiler. There is a certain criteria which needs to be met, some type of benefits qualify automatically, where as others may need an extra ‘qualifying component’ in order to have a successful boiler grant claim. It’s not always just down to the type of benefits which are being received. It is also down to the type of boiler which is present in the property, it needs to be over a certain age (cant be a condensing/A Rated boiler) or it needs to be broken/in-efficient. What benefits are needed to claim a free boiler? There are three different groups which will qualify you for a free replacement gas boiler under the UK Governments ECO Scheme. We’ll go over the ones which qualify automatically first. This is a top-up to your standard state pension. This is not to be confused as a standard Pension. If you receive Pension Credit as one of your benefits, you qualify automatically for a free replacement boiler. If you receive Child Tax Credits and your household income for last year was less than £15,860, you will also qualify automatically to have your old gas boiler replaced 100% free of charge. Your income needs to be less than £15,860 in order to qualify. ECO was designed to help low-income households to access free replacements boilers and home insulation. 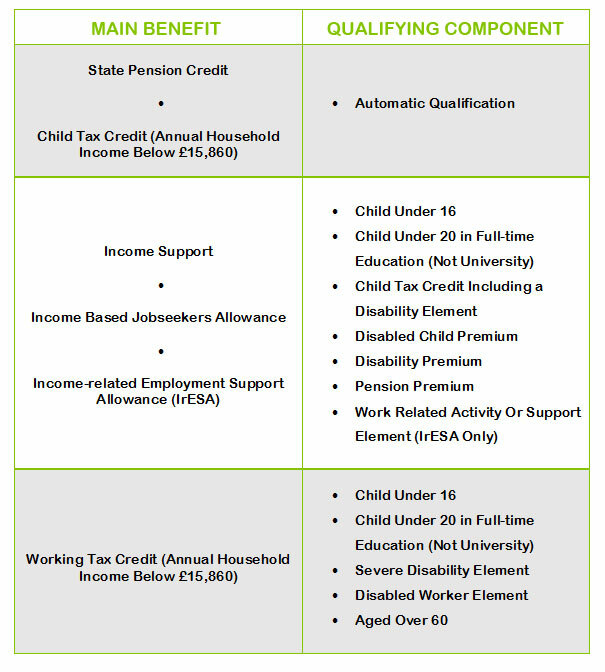 Income-Based Job Seekers Allowance (JSA), Income-Related Employment and Support Allowance (ESA) & Income Support. If you receive Income-Related Employment & Support Allowance and receive a Work Related Activity Group or Support Component then you should also technically qualify for a free boiler as long as you have an old boiler which is in-efficient. If you receive working tax credits and your income is less than £15,860, then yes, you should qualify for a free replacement boiler under the governments ECO Scheme if you also receive one of the below ‘qualifying components’. If you fit in to one of the above groups, then you should qualify for a free replacement boiler. Are you the home owner, private tenant or a landlord? In order to apply for a boiler grant, you must be the home owner, private tenant or landlord. You can not apply for a free boiler if you are in a council property or housing association. Is your current boiler broken, old, or in-efficient? You may fit in to the above, but, to replace a boiler for free, the current one needs to be over 7 years old (not A rated/condensing) or be broken. What a brilliant scheme! I work but still claim working tax credits because of my low-income. I will apply! Great site, the scheme works great for those on Benefits wanting a free boiler. I get working tax credits, can I claim a free boiler? I managed to get a free boiler because I’m on working tax credits and I have a young child in my home. This is a great scheme! Great! Thanks for the link, I’m on benefits and my boiler is knakcered! Tanks for the great post, a friend of mine has had their boiler replaced under the scheme. Can I get a free boiler if I’m on tax credits? Interesting site, I didn’t realise you could free boiler. I always thought it was a con! Hmmm, can I get a free boiler if I’m on child benefits? I’m in a council house? Thanks for the great post, I’m going to look in to it! Hello there, You have done an excellent job. I will certainly digg it and for my part suggest to my friends. I am sure they will be benefited from this site. I am on benifits and my boiler is 7yrs old. I think it is B or C rated and is a combi am i entitled to a free boiler. I AM A PENSIONER RECEIVING PENSION CREDIT AND I HAVE A BOILER AGED 28 YRS OLD HAD IT TESTED AND IT WAS LESS THAN 60PER CENT DEFICIENT AM I ENTITLED TO A FREE BOILER.